With the popularity of pickup trucks among consumers, it seemed only natural that NASCAR could successfully introduce a series for these vehicles. The concept of a championship using tube-frame trucks made its debut in 1995 with twenty events. Winning the first NASCAR SuperTruck title was Mike Skinner in a Chevrolet. The current schedule is made up of twenty-three events with most races taking place on the traditional paved ovals – the two exceptions are the road course at Canadian Tire Motorsport Park and Eldora Speedway which is a dirt track. The trucks are constructed using a formula that is similar to the cars. Bodies are hung on a steel tube-frame chassis built to NASCAR specifications. The vehicles are powered by 6-liter V8 engines which produce approximately 700-horsepower using the unrestricted regulations and about 450-horsepower in the restricted rules. The naturally aspirated motors are fitted with a four-barrel carburetor and run on 98-octane E15 unleaded gasoline. The minimum weight for a truck without a driver is 3,400-pounds. Manufacturers participating in the series are Chrysler (RAM), Ford (F-150), General Motors (Chevrolet Silverado) and Toyota (Tundra). 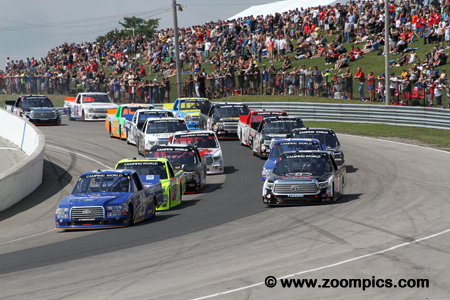 2015 was the NASCAR Camping World’s series third visit to Canadian Tire Motorsport Park. 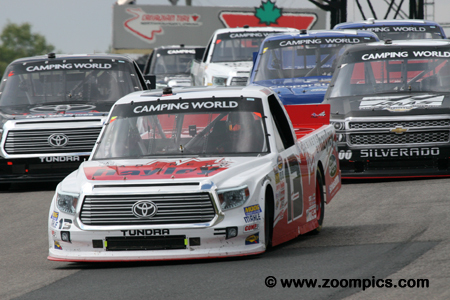 Canadian Tire Motorsport Park was not the first road course to host a NASCAR Truck race but was the only event of this type on the current schedule. Drivers would compete for sixty-four laps around the ten-turn 2.459-mile road course. A strong field of thirty-two entries started the 2015 Chevrolet Silverado 250. Leading the field through Canadian Tire Motorsport Parks very fast turn one is the pole-sitter and crowd favourite, Alex Tagliani. Directly behind Tagliani is the Toyota Tundra of the third fastest qualifier and former series champion, Matt Crafton. 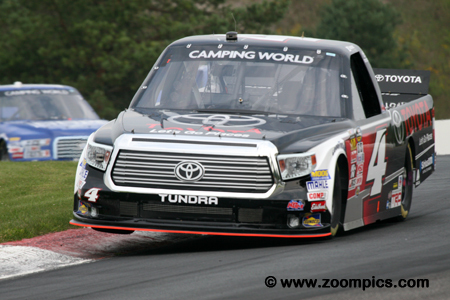 Leading the outside row into corner one is the second place starter, Erik Jones in a Toyota Tundra. Erik Jones entered round fifteen of the 2015 NASCAR Camping World Truck Series third in the standings. But a win and misfortune for the point’s leader, Tyler Reddick allowed Jones to leave Canadian Tire Motorsport Park first in the title chase - a three-point lead over the defending champion, Matt Crafton. Jones qualified second in a Kyle Busch Toyota Tundra and took the lead with just two laps remaining in the contest. 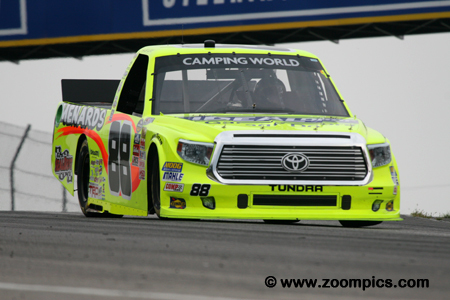 Defending series champion, Matt Crafton in the Ideal Doors / Menards sponsored Toyota Tundra qualified third. Crafton’s season had been good so far; he had four wins (Atlanta Motor Speedway, Kansas Speedway, Texas Motor Speedway and Kentucky Speedway) and was second in the points chase. During the race, Crafton only led one-lap but was second at the checker and maintained his position in the title chase. 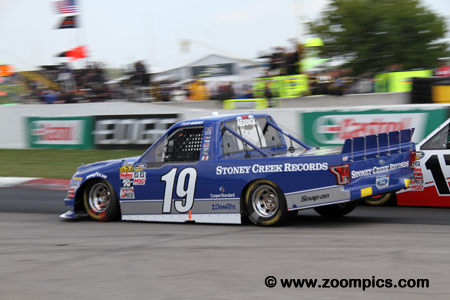 Ben Kennedy was able to capitalize on the misfortune of Alex Tagliani and finish third. 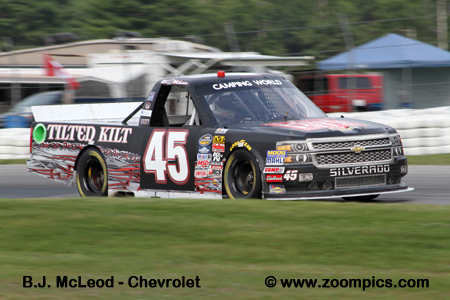 Kennedy was gridded sixth for the start of the sixty-four-lap Chevrolet Silverado 250 at Canadian Tire Motorsport Park. A steady performance kept him contention and when Tagliani encountered transmission problems with two-laps remaining in the contest, he captured third. This tied his best result of the season which was at Atlanta. Entering the Canadian round, Tyler Reddick led the point standings by seven markers over the defending NASCAR Camping World Truck Series Champion, Matt Crafton. Driving the BBR / Stoney Creek Records Ford F-150 for Brad Keselowski Racing, Reddick started fourth. Unfortunately for Reddick, he tangled with Gray Gaulding on lap-59 which dropped him to a nineteenth place finish and third in the standings. Another competitor that was able to exploit Alex Tagliani’s gearbox issue was, Daniel Hemric. Hemric started the race mid-pack - thirteenth position. A solid run by the driver of the No. 14 California Clean Power sponsored Chevrolet Silverado moved him into contention as the contest came to a conclusion. His run earned him a fourth-place finish. NASCAR Camping World Truck veteran, Johnny Sauter made his first series start in 2003. 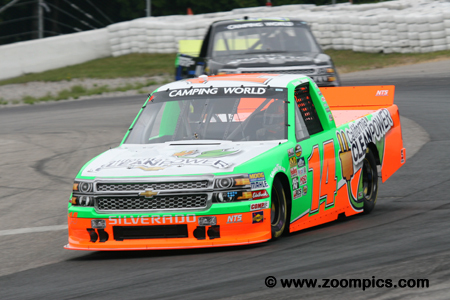 To date, Sauter had ten truck victories and was the 2011 championship runner-up. So far this season, his best results were a pair of thirds at Kansas Speedway and Gateway Motorsports Park. 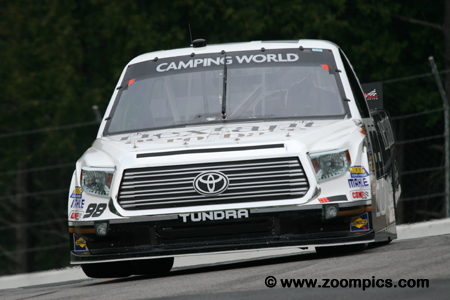 At Canadian Tire Motorsport Park, Sauter was sixth at the checkered flag after qualifying ninth quickest. Alex Tagliani was fresh off a second place finish in the Xfinity race at Mid-Ohio. 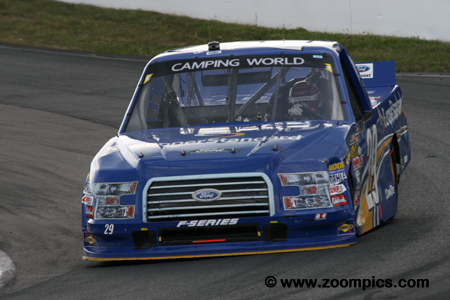 Tagliani only had one Camping World Truck start which was at Canadian Tire Motorsport Park in 2014. At that event, he qualified on the pole and ended up sixteenth. In 2015, Tagliani drove the Cooper Standard Ford F-150. He grabbed his second consecutive pole and was leading two laps from the end of the race when he lost third gear. There was a second driver entered that local fans could cheer for – Canadian Cameron Hayley. 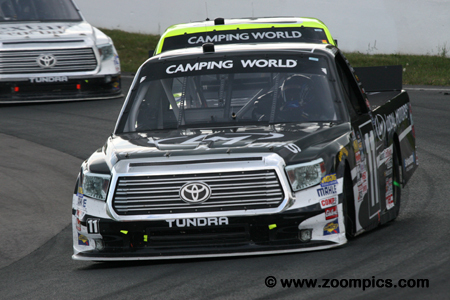 Hayley driving the Cabinets by Hayley Toyota Tundra was a series regular – often finishing in the top-ten. His best result in 2015 was a fourth-place run at Pocono. At Canadian Tire Motorsport Park, Hayley qualified seventh and would maintain that position to the conclusion of the event.